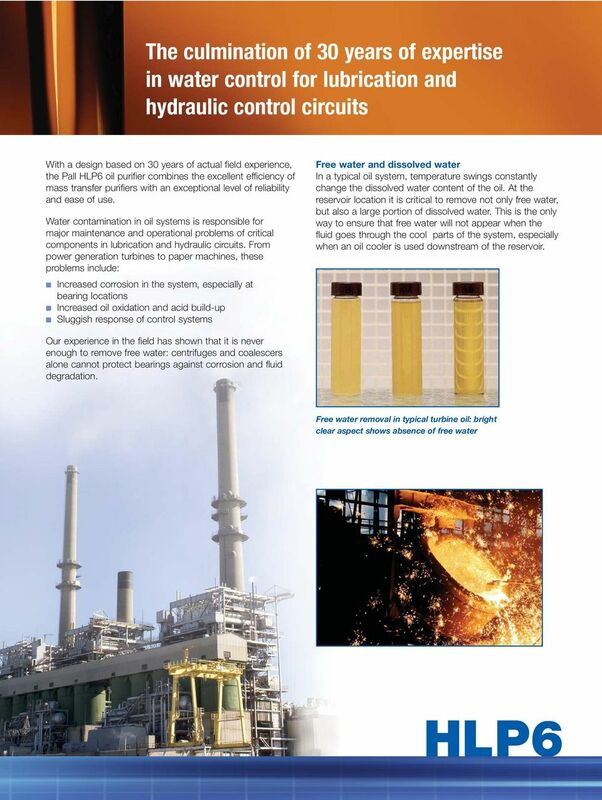 Download "Pall HLP6 Oil Purifier"
3 Tower Pall expertise is best illustrated by the newly designed separation tower. 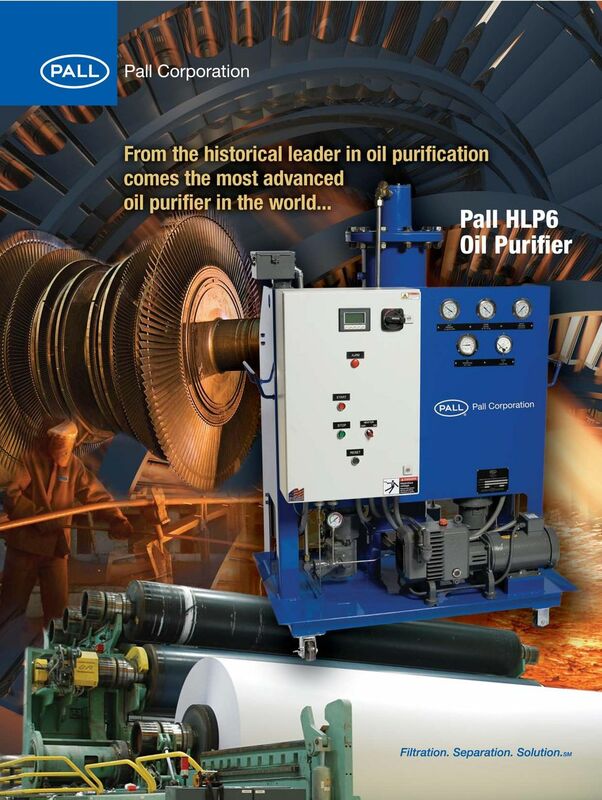 Packed with newly designed rings to ensure maximum exchange surface between oil and air, the Pall purifier maximizes water removal efficiency thanks to higher mass transfer. Optimized level control The outlet pump continuously adjusts flow rate to maintain the optimum level inside the tower. Fluid level trips are virtually eliminated. New mist eliminator Stainless steel packing at the top of the tower eliminates oil carryover and drains the coalesced oil back into the tower. Oil delivery system eliminates carryover potential. From a dedicated inlet pump, the oil is delivered under pressure through a newly designed manifold. The oil delivery is independent of head pressure condition, for a very flexible installation, better efficiency and easy operation. Unattended operation The Pall purifier is fully PLC controlled and designed to operate totally unattended. New claw style vacuum pump design Not susceptible to oil carryover, the pump only needs minor maintenance every 365 days. 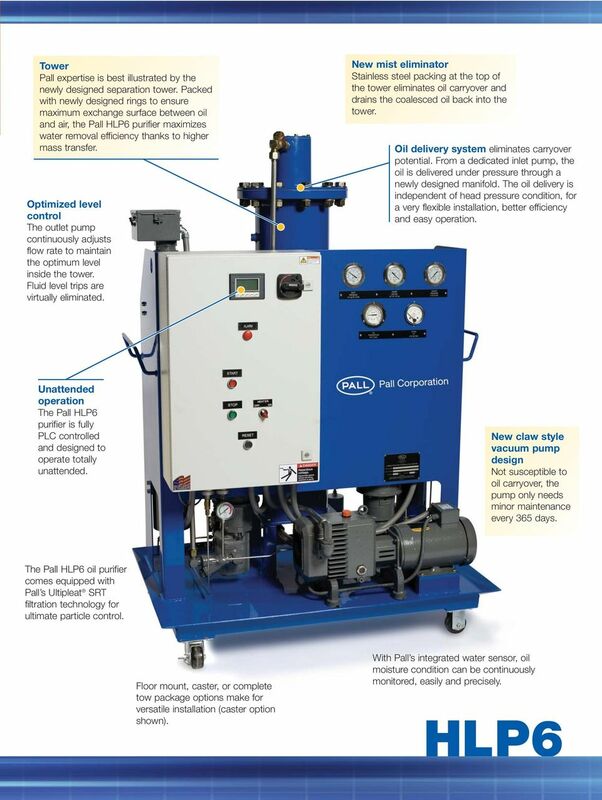 The Pall oil purifier comes equipped with Pall s Ultipleat SRT filtration technology for ultimate particle control. Floor mount, caster, or complete tow package options make for versatile installation (caster option shown). With Pall s integrated water sensor, oil moisture condition can be continuously monitored, easily and precisely. 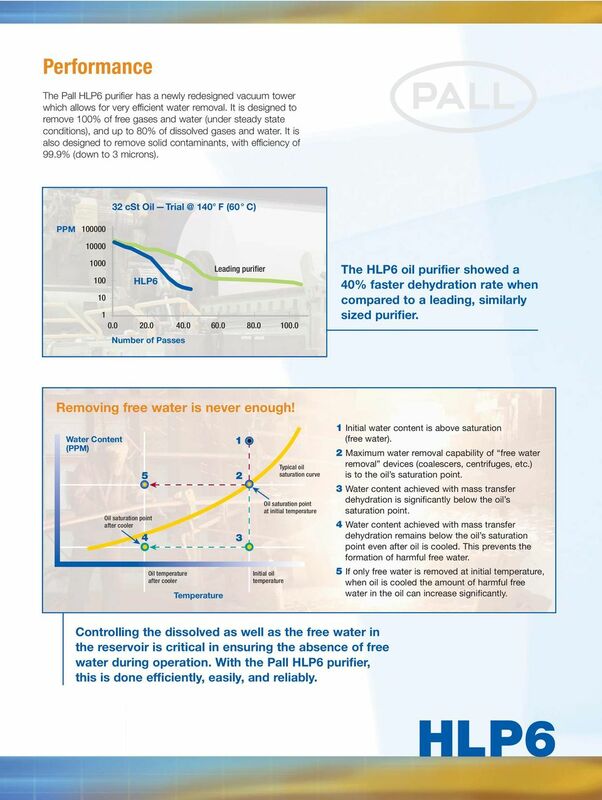 4 Performance The Pall purifier has a newly redesigned vacuum tower which allows for very efficient water removal. It is designed to remove 100% of free gases and water (under steady state conditions), and up to 80% of dissolved gases and water. It is also designed to remove solid contaminants, with efficiency of 99.9% (down to 3 microns). 32 cst Oil 140 F (60 C) PPM Leading purifier Number of Passes The oil purifier showed a 40% faster dehydration rate when compared to a leading, similarly sized purifier. Removing free water is never enough! Water Content (PPM) 5 Oil saturation point after cooler 4 Oil temperature after cooler Temperature Typical oil saturation curve Oil saturation point at initial temperature Initial oil temperature 1 Initial water content is above saturation (free water). 2 Maximum water removal capability of free water removal devices (coalescers, centrifuges, etc.) is to the oil s saturation point. 3 Water content achieved with mass transfer dehydration is significantly below the oil s saturation point. 4 Water content achieved with mass transfer dehydration remains below the oil s saturation point even after oil is cooled. This prevents the formation of harmful free water. 5 If only free water is removed at initial temperature, when oil is cooled the amount of harmful free water in the oil can increase significantly. Controlling the dissolved as well as the free water in the reservoir is critical in ensuring the absence of free water during operation. 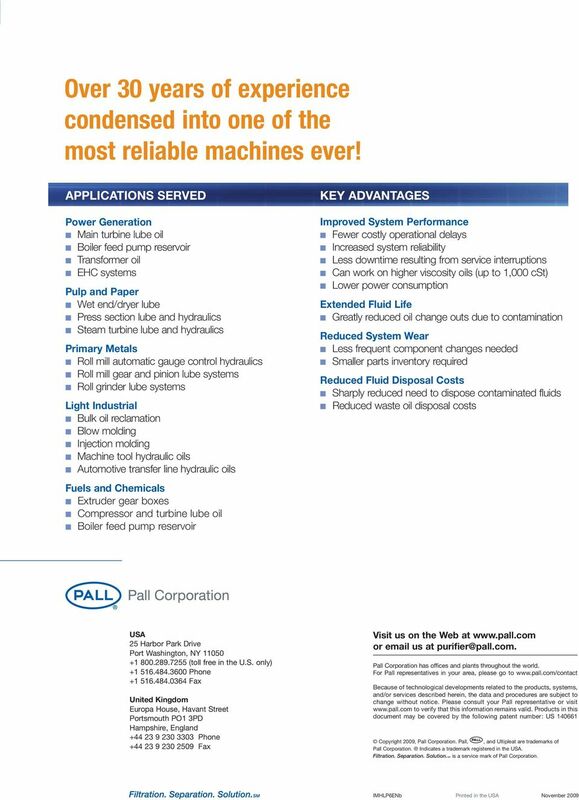 With the Pall purifier, this is done efficiently, easily, and reliably. 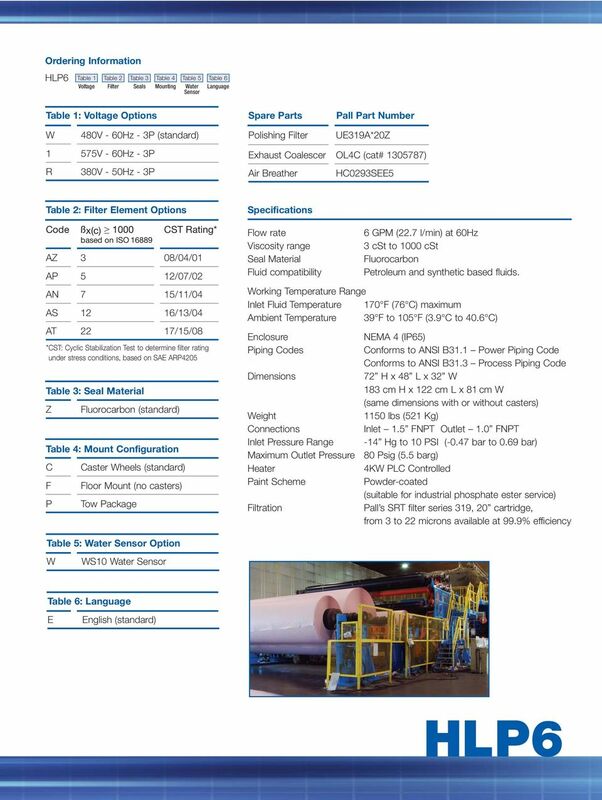 Data Sheet PIUFFSENa Ultipleat igh Flow Filter System Description The Ultipleat igh Flow filter is a large diameter, coreless, single open ended, pleated cartridge with an inside-to-outside flow pattern. Phoenix C1X - Membrane Based Portable Lube and Hydraulic Oil Purifier Cart For use in Hazardous Duty Locations. Improve Pneumatics Performance Through Filtration System Design by Scott Minato, Marketing Manager Air Preparation Products, Numatics, Inc. Barbara Pontisso, Filtration Products Specialist Numatics, Inc.